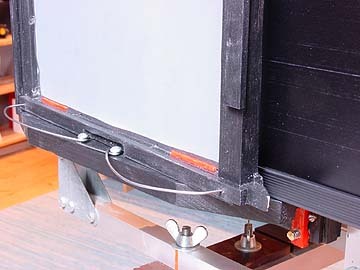 This is my home-built view camera, a monorail construction with full adjustment capability. It is rock solid, but not too heavy to be carried around. New: Now I do provide drawings of my camera design. I also have a short discussion of some design decisions. Ready for download is the bitmap formatted version of the plans (a GIF file of 112KB, showing 7 full pages of drawings). The problem with this file is that it does noct have the full detail, it is only 72 dpi for screen viewing, so some fine lines melt to one big line. dedicated image viewing application (like JPEGview on the Mac, Corel Photo-Paint or Alchemy Mindworks Graphic Workshop in Windows, xv in Solaris). I have a PDF version of the plans (still rather big, sorry). The PDF format preserves full detail. You can view the file, zoom in, or print it out using the freely available viewer "Acrobat Reader" from Adobe. Ask for availibility of other file formats if you cannot use these files. This camera supports film sizes of 13x18cm (5x7 inches) and 18x24cm (approx. 8x10 inches). 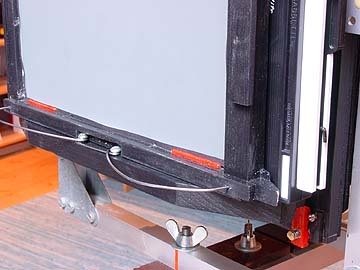 only the camera back has to be modified (i.e., add a new adapter frame). I have now prepared drawings of the back of the camera too. This is included in the above mentioned PDF document. I decided to switch to the American format. compatible with the rest of the LF world. 2001-07-05: The new back is just finished, today I shot my first test photograph. Here you see how the camera with its new back looks like. ... and taking it out again. More images of my camera are here. 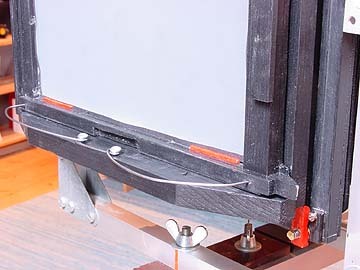 For another homebrew large format camera project, see the WWW pages of Jon Grepstad about his wooden 4x5 inches design. A successful user of his design can be found here. and a very detailed instruction for building bellows. Another site is WESTMARK by Helmut Weber with ideas and parts for your own projects. 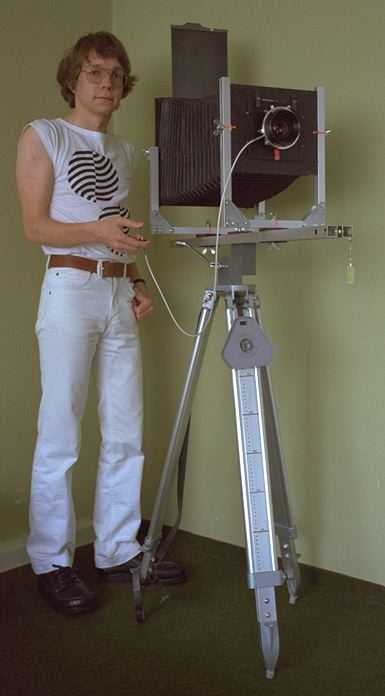 beautiful homebrew 8x10' camera, by my email-friend Harry Martin. I admire him developing his LF slides (color E6 processing) himself. I have a (simple) FAQ, a list of frequently asked questions, in text format. you can look at this FAQ text. 1 visitors since 7th Oct 2002.